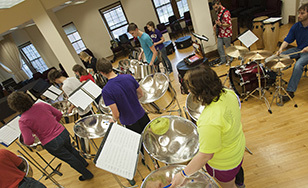 The College's percussion ensembles will take audiences on a musical journey to warmer climates during an "Island-Hopping" concert at 7:30 p.m. Saturday, April 22 in the Mitchell Auditorium on campus. Join the performers for a virtual trip through the Caribbean islands and the ports of South America as they feature a variety of musical styles: Soca, Calypso, Reggae, Son, Batucada, and more. The energy and enthusiasm of this music is meant to get audience members ready for summer. Special guests for the performance will include the Yabobo African Drum Group, who will perform "Yankadi and Makru" styles of West African dancing, and Michael McKenna, who will play the Mbira, a "thumb piano" that is a traditional musical instrument among the Shona people of Zimbabwe. Tickets are $5. For more information, contact the Spotlight box office at spotlight@css.edu or 218-723-7000. -"Equilibrium" with the St. Scholastica choirs, 7:30 p.m. April 28.